-Hippocrates, father of medicine, 431 B.C. An unhealthy diet is a proven cause of disease. According to current estimates, three out of four Americans die every year from diet related diseases such as cancer, cardiovascular disease, and diabetes. So it’s exciting to see scientific research proving what Hippocrates told us 2,400 years ago. In his TED talk “Can we eat to starve cancer?”, Dr. William Li presents a new way to think about treating cancer and other diseases: anti-angiogenesis, i.e. eating foods that prevent the formation of blood vessels that tumors need to grow. 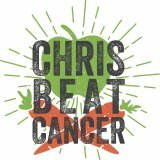 The crucial first (and best) step is eating cancer-fighting foods that cut off the supply lines and beat cancer at its own game like: berries, cruciferous veggies, green tea, and garlic. Eating 5-9 servings of fruit and vegetables per day greatly reduces your risk for all diet-related diseases. The foundation of my anti-cancer strategy was consuming 15-20 servings of organic fruits and vegetables per day by juicing, eating my giant cancer-fighting salad, and drinking my anti-cancer fruit smoothie. Note: I think it would be wise for cancer patients to avoid red wine and tuna, and to consume dark chocolate (raw cacao) sparingly. Enjoy Dr Li’s fascinating talk!